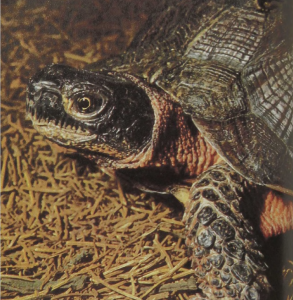 The Wood Turtle is a beautiful and apparently quite intelligent pond turtle that was once quite common in the central and northeastern United States. Individuals ranged widely over the forested areas feeding on plants, small invertebrates, and occasionally on carrion. The shell is irregular and has a series of sculptured ridges rising to the center of each scale of the carapace. Wood Turtles mate underwater and lay from four to 12, generally about seven or eight, eggs. These turtles hear quite well and learn to run mazes about as well as rats do. They are now protected in several of the eastern United States.